The Republican candidate, Senator Barry Goldwater of Arizona, suffered from a lack of support from his own party and his deeply unpopular conservative political positions. 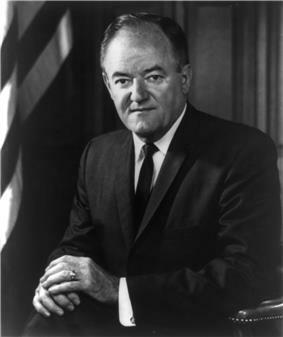 Johnson's campaign advocated social programs and further federal efforts to curb racial segregation, collectively known as the Great Society, and successfully portrayed Goldwater as being a dangerous extremist. Johnson easily won the Presidency, carrying 44 of the 50 states and the District of Columbia. Goldwater's unsuccessful bid influenced the Alaska for the Democrats for the first (and only) time, as well as Maine (for the first time since 1912) and Vermont (for the first time since the Democratic Party was founded). Since the 1990s, Vermont and Maine have rested solidly in the Democratic column and Georgia in the Republican fold for presidential elections. No post-1964 Democratic presidential candidate has been able to match or better Johnson's performance in the electoral college (The only Republicans to do so since have been Nixon in 1972 and Ronald Reagan in 1980 and 1984), or Johnson’s performance in the Mountain and Midwestern regions of the United States. President Kennedy was assassinated on November 22, 1963 in Dallas, Texas. Supporters were shocked and saddened by the loss of the charismatic Kennedy, while opposition candidates were put in the awkward position of running against the policies of a slain president. The segregationist Governor of Alabama, Maryland, Indiana, and Wisconsin against favorite son candidates who were stalking horses for Johnson. All favorite-sons, however, won their primaries. In California Yorty lost to Brown. At the national convention the integrated South Carolina. Johnson also faced trouble from Robert F. Kennedy, President Kennedy's younger brother and the U.S. Attorney General. Kennedy and Johnson's relationship was troubled from the time Robert Kennedy was a Senate staffer. Then-Majority Leader Johnson surmised that Kennedy's hostility was the direct result of the fact that Johnson frequently recounted a story that embarrassed Kennedy's father, Joseph P. Kennedy, the ambassador to the United Kingdom. According to his recounting, Johnson and President Franklin D. Roosevelt misled the ambassador, upon a return visit to the United States, to believe that Roosevelt wished to meet in Washington for friendly purposes; in fact Roosevelt planned to—and did—fire the ambassador, due to the ambassador's well publicized views. The Johnson–Kennedy hostility was rendered mutual in the 1960 primaries and the 1960 Democratic National Convention, when Robert Kennedy had tried to prevent Johnson from becoming his brother's running mate, a move that deeply embittered both men. Hours after John Kennedy's assassination, Johnson opted to call Robert Kennedy to ask the bereaved brother to remind him the exact language of the constitutional oath of office. In the first primary, in New Hampshire, both Rockefeller and Goldwater were considered to be the favorites, but the voters instead gave a surprising victory to the U.S. ambassador to South Vietnam, Henry Cabot Lodge, Jr., Nixon's running mate in 1960 and a former Massachusetts senator. Lodge was a write-in candidate. Lodge went on to win the Massachusetts and New Jersey primaries before finally deciding that he didn't want the Republican nomination, he then withdrew his candidacy. The final showdown between Goldwater and Rockefeller was in the California primary. In spite of the previous accusations regarding his marriage, Rockefeller led Goldwater in most opinion polls in California, and he appeared headed for victory when his new wife gave birth to a son, Nelson Rockefeller, Jr., three days before the primary. His son's birth brought the issue of adultery front and center, and Rockefeller suddenly lost ground in the polls. Goldwater won the primary by a narrow 51–49% margin, thus eliminating Rockefeller as a serious contender and all but clinching the nomination. With Rockefeller's elimination, the party's moderates and liberals turned to William Scranton, the Governor of Pennsylvania, in the hopes that he could stop Goldwater. However, as the Republican Convention began Goldwater was seen as the heavy favorite to win the nomination. The vice-presidential nomination went to little-known Republican Party Chairman William E. Miller, a Congressman from upstate New York. Goldwater stated that he chose Miller simply because "he drives [President] Johnson nuts". Although Goldwater had been successful in rallying conservatives, he was unable to broaden his base of support for the general election. 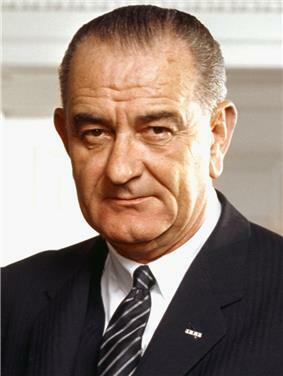 Shortly before the Republican Convention, he had alienated most moderate Republicans by his vote against the Civil Rights Act of 1964, which Johnson championed and signed into law. Goldwater's campaign manager, Denison Kitchel, a Phoenix lawyer and friend of nearly three decades, wrote Goldwater's speech explaining his opposition to the Civil Rights Act. 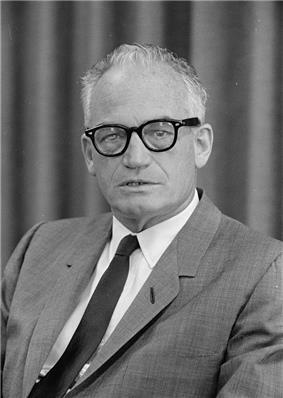 The Johnson camp used the vote against the legislation to paint Goldwater as a racist, even though Goldwater supported the civil rights cause in general, and voted in favor of the 1957 and 1960 Civil Rights acts. Goldwater considered desegregation a matter for the individual states, rather than a national policy. Goldwater was famous for speaking "off-the-cuff" at times, and many of his former statements were given wide publicity by the Democrats. In the early 1960s, Goldwater had called the Eisenhower administration "a dime store New Deal", and the former president never fully forgave him or offered him his full support in the election. Goldwater was also hurt by the reluctance of many prominent moderate Republicans to support him. Governors Richard Nixon and Governor Scranton of Pennsylvania loyally supported the GOP ticket and campaigned for Goldwater, although Nixon did not entirely agree with Goldwater's political stances and said that it would "be a tragedy" if Goldwater's platform were not "challenged and repudiated" by the Republicans. The New York Herald-Tribune, a voice for eastern Republicans (and a target for Goldwater activists during the primaries), supported Johnson in the general election. Some moderates even formed a "Republicans for Johnson" organization, although most prominent GOP politicians avoided being associated with it. Fact magazine published an article polling psychiatrists around the country as to Goldwater's sanity. 1,189 psychiatrists appeared to agree that Goldwater was "emotionally unstable" and unfit for office, though none of the members had actually interviewed Goldwater. The article received heavy publicity. 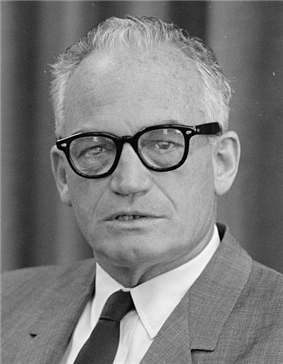 In a libel suit, Goldwater was ultimately awarded $75 000 in compensation. Eisenhower's strong backing could have been an asset to the Goldwater campaign, but instead its absence was clearly noticed. When questioned about the presidential capabilities of the former President's younger brother, university administrator Milton S. Eisenhower, in July 1964, Goldwater replied, "One Eisenhower in a generation is enough." However, Eisenhower did not openly repudiate Goldwater and made one television commercial for Goldwater's campaign. A prominent Hollywood celebrity who vigorously supported Goldwater was Ronald Reagan. Reagan gave a well-received televised speech supporting Goldwater; it was so popular that Goldwater's advisors had it played on local television stations around the nation. Many historians consider this speech to mark the beginning of Reagan's transformation from an actor to a political leader. In 1966, Reagan would be elected Governor of California in a landslide. The election campaign was disrupted for a week by the death of former president Herbert Hoover on October 20, 1964, because it was considered disrespectful to be campaigning during a time of mourning. Hoover died of natural causes. He had been President of the United States from 1929 to 1933. Both major candidates attended his funeral. 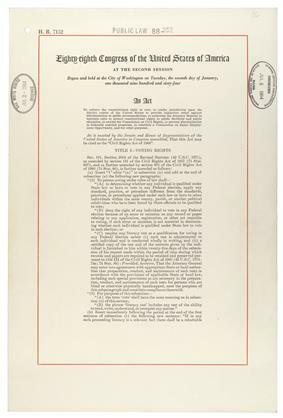 The election was held on November 3, 1964. Johnson beat Goldwater in the general election, winning over 61 percent of the popular vote, the highest percentage since the popular vote first became widespread in Alabama and South Carolina--that had been increasingly alienated by Democratic civil rights policies. This was the best showing in the South for a GOP candidate since Reconstruction. The five Southern states that voted for Goldwater swung over dramatically to support him. For instance, in Mississippi, where Democrat Solid South" became a Republican bastion. Nonetheless, Johnson still managed to eke out a bare popular majority of 51–49% (6.307 to 5.993 million) in the eleven former Confederate states. Conversely, Johnson was the first Democrat ever to carry the state of Vermont in a Presidential election, and only the second Democrat to carry Maine in the 20th century. Maine and Vermont had been the only states that FDR had failed to carry during any of his four successful presidential bids. Source (Popular Vote): Leip, David. 1964 Presidential Election Results. 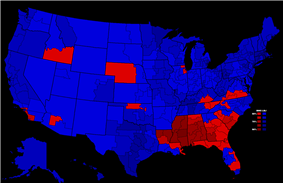 Dave Leip's Atlas of U.S. Presidential Elections (May 8, 2013). Source (Electoral Vote): Electoral College Box Scores 1789–1996. Official website of the National Archives. (August 7, 2005). Although Goldwater lost was decisively defeated, some political pundits and historians believe he laid the foundation for the conservative Reagan Revolution" of the 1980s. Indeed, many of today's leading politicians first entered politics to work for Goldwater, including Hillary Clinton. The election of 1964 was the first time since 1912 that Maine cast its electoral votes for a Democratic presidential candidate, and the first time since 1852 that Maine gave a Democratic presidential candidate an absolute majority of the popular vote (The Democrats narrowly won Maine in 1912 with only a 39% plurality, in a 3-way race against a split Republican base). ^ "Denison Kitchel, 94, Chief of Goldwater Campaign". ^ Will, George (October 3, 2010). "With their hands tied, Democrats pound the table". Atlanta Journal-Constitution. p. A23. ^ Sallie Satel (June 30, 2004). "Essay; The Perils of Putting National Leaders on the Couch". New York Times. ^ "Confessions of a Republican"
^ "1964 Presidential General Election Data - National". Retrieved March 18, 2013. George H. Gallup (ed. ), ed. (1972). The Gallup Poll: Public Opinion, 1935–1971. 3 vols. Random House. Steve Fraser and Gary Gerstle (ed. ), ed. (1990). The Rise and Fall of the New Deal Order, 1930–1980. Arthur Meier Schlesinger, Jr. (ed. ), ed. (2001). History of American Presidential Elections, 1789–2000. Donaldson, Gary (2003). Liberalism's Last Hurrah: The Presidential Campaign of 1964. M. E. Sharpe. Ladd, Everett Carll, Jr.; Charles D. Hadley (1978). Transformations of the American Party System: Political Coalitions from the New Deal to the 1970s. 2nd ed. Matthews, Jeffrey J. (1997). "To Defeat a Maverick: The Goldwater Candidacy Revisited, 1963–1964". Presidential Studies Quarterly 27 (4): 662+. – a political fiction novel around the Republican campaign.